Musicians of the Minnesota Orchestra will put on a free concert at the Lake Harriet Bandshell on Sept. 16. 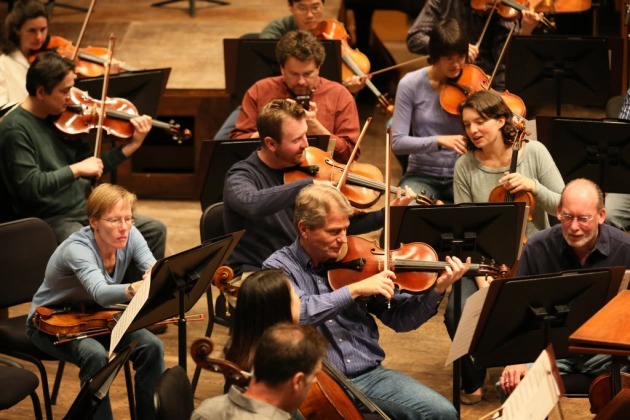 The orchestra – as an organization – used to put on free concerts each fall at Lake Harriet as a thank you to audiences, and also to stimulate interest in the season. This year, the musicians are doing it on their own. William Schrickel, a longtime bass player who has also served as music director of the Metropolitan Symphony Orchestra, will conduct the concert. Violist Sam Bergman will be host of the concert. The amiable Bergman is a frequent front man for the orchestra with the “Inside the Classics” series. The program for Sept. 16 (at 4 p.m.) includes Beethoven, Wagner, Steven Heitzig and John Williams. The concert comes while the musicians are engaged in sticky negotiations with orchestra management over a new contract. The two sides are far apart, primarily on economic issues but also on work rules. Further, Orchestra Hall’s renovation has pushed the group into the Minneapolis Convention Center for the 2012-13 season – which doesn’t start until mid October. Musicians at the St. Paul Chamber Orchestra, similarly embroiled in contentious labor bargaining, performed at the AFL-CIO center at the Minnesota State Fair last week. Negotiations in both cases will come to a head on Sept. 30.